Near the beginning of my walk at the Berkeley Marina today a stand of fennel caught my eye, lovely with its combination of textures and hues: the sturdy, celery-colored stalks, the bright green of the feathery leaves, and the sunny yellow of the blooms. 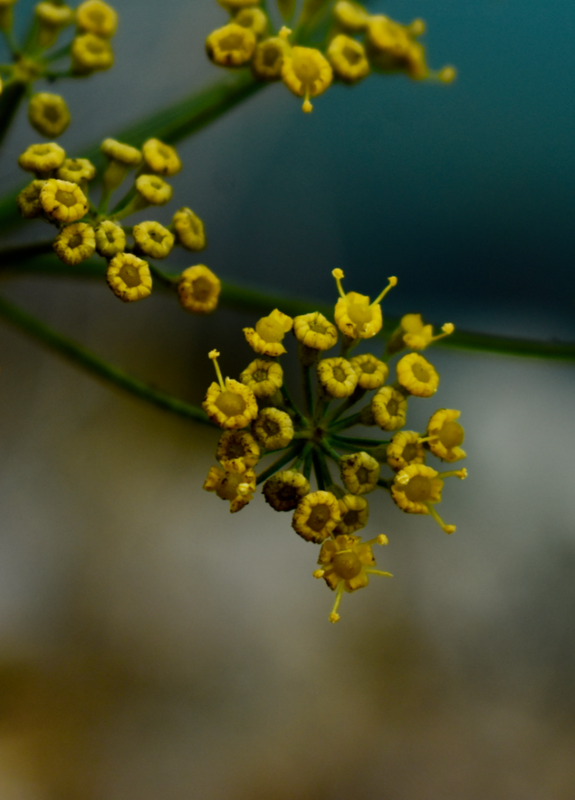 All those individual plants, each having thrust up toward the light, grown and finally bloomed, coming together to form a single stand of fennel. How the multiple and many grow to become one, a formation more beautiful than its individual parts, where no one plant stands out above the others. But when I reached the middle of the stand, something made me stop and look more closely at one single flower head. Composed of a multiplicity of blooms, with enough space in between to allow the light to shine through and outline each head, posed on the end of a tendril attached to a central stem, the flower head was beautiful. 15, 16 17, I began counting the individual blooms on the head, marveling at the intricacy of the plant, the way each flower head is a composite of even tinier blooms, all attached to a smaller, delicately curved tendril, called the pedicel, the collection of tendrils all coming together at—or emanating from– the top of the stem. And then I moved closer, to gaze at one miniature flower head within the larger bloom, which together with all the other larger blooms, form the plant’s flower head. Even more exquisite, the parts here appeared perfect replicas of the larger blooms, everything miniaturized to the size of a fingernail. By this point, I admit it, I was nearly swooning. So much beauty! Wanting to continue my walk, I plucked a miniature flowerhead from the plant and placed it on the dashboard of my car. I wanted to be able to take it home and study at my leisure. Then I walked twice around the Marina, enjoying the vistas and the other walkers. Still thinking about the fennel, I returned to my car at the end of my walk. When I slid into the driver’s seat, the nail-sized, perfect miniature of a fennel bloom caught my eye. Oh my, I thought, and felt a huge smile breaking on my face. Oh my! What a perfect specimen of small. Thanks, Cookie. good seeing you last week.